As a child grows he or she develops and expands the ‘vocabulary’ of body language. New behaviours can emerge seemingly overnight, and old behaviours can take on entirely new meanings. Perhaps the most dramatic changes occur during the toddler and preschool years, when children go through the process of mastering verbal communication. Now, these examples apply to both toddler interactions with adults and other toddlers. With other toddlers, though, body language is apt to be more pronounced and forceful. So, for instance, if one toddler wants the toy another toddler is using, he or she will just walk up and grab it to take it away. Body language is also a powerful indicator of a toddler’s comfort level with a particular situation. Think about a group of toddlers in a play area, and you can easily picture some playing happily, some engaged in conflict with each other, and one or two hanging back and not participating at all. It’s easy to imagine those hanging back being uncomfortable in the groups, but those involved in conflicts are often just as uncomfortable. They simply express their discomfort by becoming very assertive rather than very submissive. Can you see the pattern emerging here? 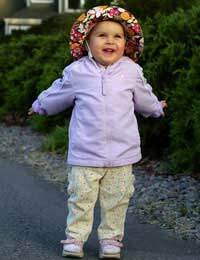 Preschoolers still depend on body language a great deal (as do adults) but are learning how to combine verbal and non-verbal strategies to express themselves and get what they want. One of the most common occurrences in these early preschool years is attempting to tell a lie. This may seem like a small thing, but it has huge implications for the years to come. When a child first attempts lying with words, body language almost inevitably gives them away. They have trouble making eye contact, they may hang their head, or otherwise appear tentative. As a child moves from first words to full sentences, his or her body language undergoes tremendous changes as well. During infancy the primary means of communication is body language and non-verbal cues, and most toddlers have developed an amazing array of non-verbal vocabulary. When words start to emerge, however, it is a confusing time for the child and it’s easy for frustration to set in. For instance, a child might be trying to say a particular word, but nearby adults can’t quite make it out. The child knows what he or she is saying, though, and irritation levels quickly escalate. A child’s body language often takes over at that point, whether in the form of crying, pouting, hitting, or some other expression of aggravation and frustration. This is a very challenging time for parent and child alike, requiring a great deal of patience and understanding. Parents can make the process easier for everyone by avoiding situations where frustration might occur (missing a nap, becoming over stimulated, unfamiliar and frightening circumstances) and being prepared to redirect the child’s attention if aggravation sets in. Redirection might include keeping a favourite book on hand, or a small colouring book with crayons – anything that can quickly and easily capture a child’s attention and move it away from the communication problems. My 2 year old has been acting out a lot lately. When I ask her why she did something, or call her out on it and explain its bad we dont do that. She smiles and shrugs her shoulders and wont answer me or talk at all. She is doing this every time she does something she knows she shouldn't. Just wondering why shes doing this? Just keep being consistent with her for now - she may be just pushing the boundaries. Reward good behaviour with lots of praise etc. If you concerned speak to your GP. I had a Grandmother who spoke Italian. I did not speak Italian but I was able to understand her and we communicated with body language and gestures. Perhaps there were one or two words that I knew in Italian and one or two words that she knew in English but really not enough to communicate. I was always amazed that when we were left alone, without any translators, we were able to speak to each other. My Grandmother passed away when I was 24 but I do remember our gesturing conversations. Maybe the gestures and talking with our hands is a stereotype of the Italian people but it really worked for us.Ahhh, fond memories. What a lovely anecdote. Thanks for sharing. I had a Grandmother who spoke Italian.I did not speak Italian but I was able to understand her and we communicated with body language and gestures.Perhaps there were one or two words that I knew in Italian and one or two words that she knew in English but really not enough to communicate. I was always amazed that when we were left alone, without any translators, we were able to speak to each other.My Grandmother passed away when I was 24 but I do remember our gesturing conversations.Maybe the gestures and talking with our hands is a stereotype of the Italian people but it really worked for us. Ahhh, fond memories.